Google likes equations. The Internet giant has made billions off its search algorithms, formulas that are as complex as they are top secret. But Google is making no effort to cover up its newest formula, one that is bracingly simple: REC. That means renewable energy that costs less than coal  and it's the guiding principle behind Google's surprising move into clean power. Perhaps stung by criticism that its servers are energy hogs, the company is investing hundreds of millions into renewable energy, seeding small solar and wind start-ups and supporting a lab of its own researchers. The idea is simple: use the same brainpower that conquered the Internet to solve the biggest challenge facing the planet. "We see a chance to make a difference in the field of renewable energy and energy information that can help bring the world to a lower carbon and more efficient economy," says Google's Bill Weihl. Weihl, a former professor at the Massachusetts Institute of Technology, is Google's green-energy czar, the guy charged with leading the company into the renewable-energy economy. The task begins by greening Google itself. The data centers that run 300 million web searches a day are ravenous for electricity, but through more efficient design Google has managed to cut its server energy use by more than 50%. 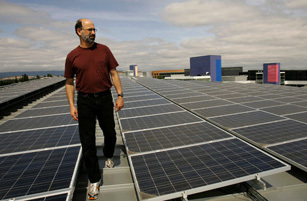 That saving, along with the renewable energy it draws from a gleaming 1.6 MW solar installation at Google's Mountain View, Calif., headquarters and carefully selected carbon offsets, has helped the company become carbon-neutral. "In the process we're saving ourselves a lot of money by making ourselves more efficient," says Weihl. But Google is an enterprise incapable of thinking small. The real goal of its green program is to help clean energy to break out of its tiny niche, just as Google went from start-up to Silicon Valley superstar in a few short years. While many environmentalists want to focus on raising the price of fossil fuels through a carbon cap, Weihl thinks the real work needs to be done in the lab, searching for the breakthroughs that will enable solar and other renewables to beat coal in the marketplace. To that end, Google is spreading its spare millions to startups like eSolar and BrightSource Energy, as well as sponsoring its own research. Right now Weihl's engineers are focusing on solar thermal power  which uses the heat of the sun to generate electricity by boiling water to turn a turbine  and developing new mirrors that could cut the cost of such plants by a quarter or more. That might work  or it might not. The important thing is that the company's brand of Silicon Valley entrepreneurship is exactly what the fight against climate change needs. "We want to help make the world better," says Weihl. Which recalls that other famous Google formula: "Don't be evil."